Create applications that run in the Console (the "DOS box") under Windows. It's as straightforward as programming for DOS, yet gets you beyond those DOS limitations. Much faster than the best DOS Basic around! 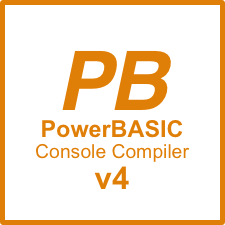 The high degree of source code compatibility with PowerBASIC, QuickBasic, GW-BASIC and BASICA makes it easy to port existing DOS applications to run under Windows 95 through Windows 10. PB/CC supports INPUT, PRINT, LOCATE, LINE INPUT, INKEY$, INSTAT, CLS, COLOR, KEY, KEY$, and LPRINT. PB/CC also has many more built-in statements for mouse handling, scrolling, and keyboard processing. Please take a look at our language reference for more information.